On Tuesday, January 10, the Bush administration was served with five indictments charging crimes against humanity. With purpose and determination, a delegation from the Bush Crimes Commission went up to the White House gates to deliver the indictments. 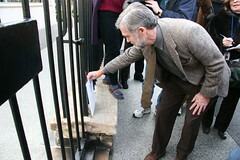 The delegation included former CIA analyst Ray McGovern, authors William Blum and Larry Everest, and members of After Downing Street, Code Pink, Democracy Rising, Progressive Democrats of America, Spirit House, and World Can't Wait--Drive Out the Bush Regime! It is highly significant when people like Janis Karpinski speak out against the Bush regime. Her witness testimony at the Tribunal will be a major event that nobody will want to miss. "We delivered those indictments because we're not going to be obedient Germans," Ray McGovern told Revolution. "Back in the '30s they hunkered down and hoped that Hitler and the Nazis would just go away. They didn't do the kind of thing we did in D.C. on Tuesday, and what we'll continue to do. Unlawful wiretapping and spying, Iraq and the torture and detentions, and on and on. This can't go down unopposed, and I do wonder about the number of months we still have before they try to come after us for what we're doing." White House personnel refused to take the indictment papers from the delegation, on grounds of "security." When the delegates explained that the envelope containing the indictments was open so that the contents could easily be checked, the White House personnel said, "We're not authorized to accept any material for the president from the public." Moments later, a police hazardous materials (hazmat) squad showed up in a large van. An officer got out, put on white gloves, gingerly approached the envelope with the indictments (which had been propped up at the White House gates), and placed it carefully in a plastic bag. As a member of the delegation told the press, "To a government that commits crimes against humanity, the truth is hazmat." Mike Hersh, a member of Progressive Democrats of America and After Downing Street, said at the press conference: "When I was a child, I watched the Watergate hearings on television. I heard testimony about an administration run amok, wiretapping and spying, arrogantly abusing the power 'we the people' entrusted to it, and lying about it all. Many of us thought that the Nixon gang reached the zenith of presidential corruption, but we were sadly mistaken. "Today, in that building over there [the White House], sit men and women who not only believe they're above the law, but who openly arrogate to themselves powers and prerogatives which would make a monarch blush. When Bush spoke to America about the outrage of illegal spying, it wasn't to condemn the lawbreakers, it was to rage against the truth-tellers who exposed his administration's reckless lawlessness." 5) Knowing Failure to Protect Life During Hurricane Katrina. "There is a particular urgency to the Commission's work now. Questioning, distrust, and anger over actions by the Bush regime have grown by leaps and bounds... This Commission of Inquiry is an instrumentality of world humanity and an imperative of conscience. It can become a vehicle for the millions looking for clarity and voice, can change the terms of debate, and can deliver a powerful and urgently needed 'j'accuse' ('I accuse') right in Bush's brave new 'homeland.'" The "International Commission of Inquiry on Crimes Against Humanity Committed by the Bush Administration," an activist tribunal in the tradition of the Russell Vietnam War Crimes Tribunal, with a seeminly extensive and varied stable of witnesses, attempted to serve an indictment on the White House. Ray McGovern, former CIA analyst and briefer to George H.W. Bush when he was Vice President, attempted to serve the papers on President George W. Bush or his counsel, Harriet Miers, on behalf of the commisstion. The documents were not accepted, were left at the gate, and later picked up by Metropolitan Police Department officers who treated it as potentially hazardous material. A selection of photographs taken this day in collaboration with Deep Dish TV. Photos are from 10 Jan 06.